The Center for American Progress Action (CAP Action) is the 501(c)(4) advocacy affiliate of the Center for American Progress. CAP describes itself as “an independent nonpartisan policy institute that is dedicated to improving the lives of all Americans, through bold, progressive ideas, as well as strong leadership and concerted action.” CAP and it’s 501(c)4 affiliated Center for American Progress Action (CAP Action) were allegedly conceived in 2002 after Democrats lost the Presidency in 2000 to George W. Bush and the lost control of both houses of Congress in 2002. John Podesta worked with then-Democratic National Committee Chairman and now-Governor of Virginia Terry McAuliffe, former Bill Clinton political director Don Sosnik, and former Clinton Deputy Chief of Staff Harold Ickes to create CAP. They connected early with Mark Schmitt of the Open Society Institute, a philanthropic venture of liberal billionaire George Soros, to get CAP off the ground. Originally launched in July 2003 as the American Majority Institution, the organization changed its name to the Center for American Progress on September 1, 2003. According to The Nation’s Robert Dreyfuss, it was not “completely wrong to see [CAP] as a shadow government, a kind of Clinton White-House-in-exile—or a White House staff in readiness for President Hillary Clinton.” In its early days as now, CAP boasts an abundance of Clinton staff. In 2004, CAP helped Clinton-confidant David Brock to create Media Matters, a left-of-center response to conservative journalism and conservative criticism of news media. CAP engages in rapid media response, long-term research projects, and policy creation on issues from criminal justice to race and ethnicity. CAP also has many spin-off organizations from left-of-center online publication Think Progress to youth-centered policy and advocacy organization Generation Progress. The Center for American Progress Action Fund is the 501(c)(4) affiliate to the Center for American Progress, sharing a mirror image mission to “produce bold, progressive ideas.” Originally founded in 2003, CAP Action had revenue of $6,44,380 and expenses of $7,678,925 in 2014. The first president and CEO of CAP Action was former U.S. Representative Tom Perriello (D-Virginia), who founded controversial left-of-center religious organizations like Catholics in Alliance for the Common Good, Catholics United, Faith in Public Life, and Faithful America. CAP Action runs a left-of-center blog, Think Progress. CAP’s youth wing is Generation Progress, formerly known as Campus Progress. The group engages young people in an effort to get them to “embrace progressive values” and push left-wing policies. Generation Progress supports youth activism and journalism and provides event and networking opportunities to mentor future left-of-center leaders. Mayors for Smart on Crime is an initiative of the Center for American Progress created by Democratic Party operative John Podesta. CAP Action also produces the American Worker Project to promote labor issues, Pushback.org to provide election coverage, and the National Security Leadership Alliance to promote more restricted American military action. 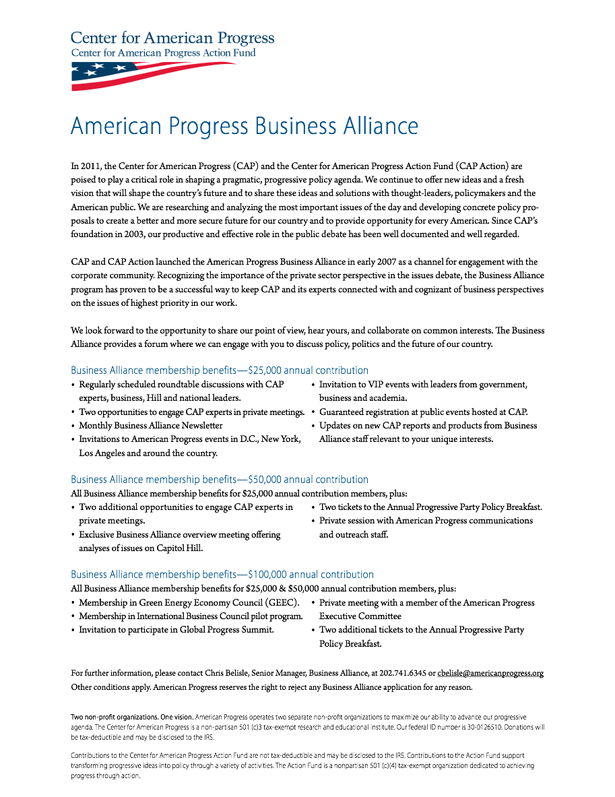 In 2007, after John Podesta stepped down as president of CAP, the organization established a “Business Alliance” to encourage corporations to donate in order to have special access to CAP’s research. According to a confidential donor pitch written by CAP, the Business Alliance is “a channel for engagement with the corporate community,” which includes three tiers of awards depending on the size of the donation ($25,000, $50,000, and $100,000 annually). Internal lists show that some of the donors include Comcast, Walmart, General Motors, Pacific Gas and Electric, General Electric, Boeing, and Lockheed; but other corporations are also included. While it is common for think tanks to includes donations from businesses with an interest in specific policy research, the left-leaning Nation noted several circumstances when CAP did not report on issues directly related to members of its’ Business Alliance. First Solar is a private green energy firm that received a $3.73 billion loan in 2012 from the Department of Energy to run the Antelope Valley project, despite allegations of corruption from congressional Republicans. During that time, CAP wrote extensively about the virtues of the Antelope Valley project, without disclosing that First Solar was part of the Business Alliance and that José Villarreal was on the board of both First Solar and CAP. An email to Podesta reported that a ThinkProgress article was flagged because it included information critical of Goldman Sachs’ internal culture in the leadup to the great recession. The article was flagged because Goldman Sachs was just about to become a CAP donor. Michael Werz, a senior fellow at CAP, often focused his work on U.S. relations with Turkey and was later appointed to become the deputy assistant secretary of European affairs in the Obama administration. The Podesta Group is a defunct lobbying firm started by longtime Clinton operative and CAP founder John Podesta and his brother, Tony Podesta. It was dissolved at the end of 2017. Some of the Podesta Group’s clients overlapped with donors to CAP. Clients to the Podesta Group who also donated to CAP directly include organizations such as Blue Shield of California, Johnson & Johnson, Lockheed Martin, Google, Novo Nordisk, Quest Diagnostics, T-Mobile, Walmart, and Wells Fargo. Some of these organizations have supported left-of-center policies, including many which CAP also advocates for, such as Obamacare. The Podesta Group also represents NBC (which is owned by General Electric, a CAP donor), whose CEO was on the Obama Administration Economic Recovery Advisory Board along with Laura D’Andrea Tyson, a CAP senior fellow. The Center for American Progress employs more than 300 people, from senior staff, editors, communications personnel, administrative workers, development staff, academic fellows, and more to policy experts on the following subjects: democracy and government, early childhood policy, economic policy, education-K-12, education (post-secondary), energy, faith, guns and crime, health, immigration, LGBT, legal progress, national security and international policy, poverty, public lands, technology, and women’s health. Carmel Martin is the executive vice president for policy at CAP. She previously worked as the assistant secretary for planning, evaluation, and policy development at the Department of Education during the Obama administration and served as a senior advisor to the former Secretary of Education Arne Duncan. Before joining the Obama administration, Martin was a general counsel and deputy staff director for the late Senator Edward Kennedy (D-Massachusetts), the chief counsel and senior policy advisor for former U.S. Senator Jeff Bingaman (D-N.M.), and the special counsel to former U.S. Senator Tom Daschle (D-S.D.). After graduating from the University of Texas School of Law, Martin worked as a trial attorney for the Civil Rights Division of the Educational Opportunities Section at the Department of Justice and in the private sector at Hogan & Hartson’s. Winnie Stachelberg is the executive vice president of external affairs at CAP. Stachelberg joined CAP in 2006 after spending 11 years at the powerful LGBT interest group Human Rights Campaign (HRC). She first joined HRC as a senior health policy advocate, then became the political director, and finally became the first president of the HRC Foundation, HRC’s 501(c)3 arm. At CAP, Stachelberg helped launched the immigration policy program, the LGBT Research and Communications Project, the gun-violence prevention network, and the Half in Ten antipoverty program. She is a graduate of Georgetown and received a master’s degree in public administration from George Washington University. According to a 2015 Politico report, CAP received significant donations from coastal power centers. CAP receives large donations from Wall Street, including at least $50,000 from both Bank of America and Goldman Sachs as well as at least $100,000 from Citigroup and Blackstone. It also receives donations from Silicon Valley, including at least $100,000 each from Apple, Google, and Microsoft and $5,000 from Facebook. Donors also include those is the Clinton and Obama inner circle, including Obama supporters Joan and Irwin Jacobs who gave at least $200,000, and Quinn Delaney and Wayne Jordan, who gave at least $100,0000. President Bill Clinton’s Treasury Secretary Robert Rubin and Obama fundraiser Orin Kramer have given at least $50,000. CAP also receives significant support from unions, including at least $100,000 from the Service Employees International Union (SEIU), at least $100,000 from the American Federation of State, County, and Municipal Employees (AFSCME), and $50,000 from the American Federation of Teachers (AFT). CAP also receives donations from the Rockefeller Foundation, Carnegie Corporation, Sea Change Foundation, Wyss Foundation, Glaser Progress Foundation, and Schwab Charitable Fund. Bank of America CVS Caremark Inc.
PG&E Corporation Time Warner Inc.
Taipei Economic and Cultural Representative Office in the United States Visa Inc.
Past donors to CAP Action include the Annie E. Casey Foundation, Wendy and Jim Abrams, Ben Barnes, Google, Harold Ickes, Jack Marco, and Will Robinson.